I hope that this post finds you all well, dry, safe, and happy. I know that many teachers, in my own state and farther north, were adversely affected by Hurricane Sandy. When I returned to school this morning myself, I found that part of my classroom ceiling had fallen in, and some of my own books and materials were soaked and ruined. While the damage was minimal, and I have managed to dry some items out, it really got me to thinking about the many teachers out there who may have lost everything. With that in mind, I am working to put together some resources to send to teachers in the affected areas. While we cannot replace everything that they lost, we certainly can help them get back on their feet by giving what we have. 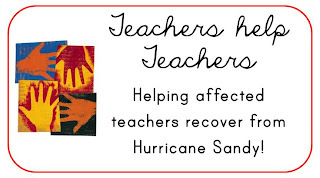 If you are a teacher affected by Hurricane Sandy, please click the button below to fill out the form requesting help. If you are a teacher or have a store on TpT or TN, then please consider donating some of your products or materials to a teacher in need! If you are interested, please click the "teachers helping teachers" button below and fill out the requested information.Teachers of all grade levels are welcome and encouraged to participate! I will send out an e-mail when it is time to send in your donated product, and I will handle separating the products into grade-level bundles for distribution and distributing to schools and teachers in need. Donations close Tuesday, November 13, 2012. Click the "Teachers help Teachers" button below and fill your information into the form. If you have a blog, blog about this and add the button below to your post, and link it to this blogpost. (this can be done by copying the image and inserting it into your post, then copying the link location and linking the picture). If you don't have a blog but still wish to donate and share, then pintrest, Facebook and Twitter about it! Join the linky party below and link to your blog post (if you have a blog) or your TpT store if you do not have a blog. What if I do not have a TpT store? At this point, I have had multiple teachers express interest in holding drives at their school to send hard goods to teachers in need. If you are interested in this, please fill out the form by clicking the link above. I am setting up an "adoption program" where I will put teachers who have hard goods to donate in contact with teachers who request assistance using the "I need help" form. The teachers who request assistance through the form and are "adopted" by teachers will also receive the digital goods appropriate to their grade level/subject area. Thanks so much for thinking about our colleagues in need! So sorry about your classroom! I love this idea. Thank you so much for setting it up. Thanks, Jessica! For the most part, my classroom is fine, but I am worried about those teachers whose classrooms aren't! Thanks for participating! What a great idea, Laurah! I am honored to be a part of it! I hope your room is okay and that you have not lost too many materials yourself. This is a wonderful idea! Thankfully my area of PA wasn't hit too badly. Thinking of those of you who were not as fortunate! I am so happy that you are doing this. I donated 2 products, blogged about it, and linked up above. I wish there was more that I could do! If there is, please let me know! I am glad to be a part of this! Thank you! I do not have a TPT store as I offer everything I create for free on my blog. Please feel free to pass on my blog to anyone who might need help. I teach Grade 3 (and 4 in the past). What an awesome thing you have taken on! I know this will mean a great deal to the affected teachers when school resumes. What a great idea! I am so happy to be able to help others! Thank you for doing this...it is very inspiring. I will blog about it today for you. I have donated some items and would be happy to donate more if you need. I don't have much in my TpT store yet as I'm new to this but have tons of books I'd be willing to mail. Just let me know. I am so happy to be able to help out by donating items for this great cause! What a wonderful thing you are doing for those in need! You are an inspiration! Thanks! Thanks for letting us help in some small way. You are a big hearted lady for thinking of others when you find yourself in the midst of devastation! Laurah, I have sent the files and linked up on my blog. Thank you for letting me help. It just feels good to be able to do something. Thank you for this wonderful idea! I am grateful for the opportunity to help out! Thank you for heading up this campaign which allows teachers from all over the country and the world to help our fellow teachers out in a time of need. You are awesome! I think what you are doing is amazing. Please let me know if I can help you in any other way! What a fabulous idea. I belong to a group of international independent app developers and we have also started a donation program. And I belong to an artist group who has done likewise. It is amazing how we all come together at these times. I have books to donate. I don't yet have my TPT store set up and have just started pulling together my old (35 years' worth) materials and ideas to clean up. I can't thank you enough for offering to do this. I know it is a tremendous amount of work. I wanted to also let everyone know about Lucy Calkin's Literacy Lifeboats Initiative to help rebuild literacy-rich classrooms after the storm: http://readingandwritingproject.com/literacy-lifeboats. I live in Maine and have recently left the teaching profession. I am a special education teacher and have thousands of dollars worth of teacher resources, games, etc. plus a huge library of books. All of my resources have been sitting in a climate controlled storage unit and I have been trying to figure out what to do with them. Due to the recent hurricane I realized that the efforts are always about backpacks for the kids and while that is important people have no idea how much money it will take teachers personally to replace their own teaching supplies. I would like to donate these to the right school or teacher group or whatever. I would really prefer these things go to the teachers and not belong to the school. I could rent a truck and bring it all down if someone has a place where they could then have teachers come and take what they want. We here have a place called Ruths Reusables that is a place where only teachers can go for free and get books and supplies and furniture etc. I think a place in New Jersey called Tools for Schools is a similar place, but cannot figure out how to contact them. If there are any other places like this down that way I would be happy to donate it all there. This is a wonderful idea and I am more than happy to donate items from my store. I do have one question first, though. Will the teachers have access to printers and paper to create the items we donate? Hi Sandy, thanks for your interest, but donations closed on Tuesday, November 13th. Everything has already been bundled and transmitted to the appropriate educational organizations for distribution.